Five-year survival rate of those who participated in breathing exercises was significantly improved. Preoperative Rehabilitation in Lung Cancer Patients: Yoga Approach. Barassi G1, Bellomo RG2, Di Iulio A3, Lococo A3, Porreca A4, Di Felice PA4, Saggini R4. Breathing exercises helped stop craving for smoking. Psychoneuroendocrinology. Author manuscript; available in PMC 2015 Nov 1.Published in final edited form as:Psychoneuroendocrinology. 2014 Nov; 49: 260–271. https://www.vox.com/2015/7/22/9012075/yoga-health-benefits-exercise-scienceThe bottom line:Yoga is probably just as good for your health as many other forms of exercise. But it seems particularly promising for improving lower back pain and — crucially — reducing inflammation in the body, which can actually help stave off disease. Yoga also seems to enhance “body awareness,” or people’s sense of what’s going on inside themselves. 2018 Annual Report on Prostate Disease from Harvard Medical School. The effect of YOCAS©® yoga for musculoskeletal symptoms among breast cancer survivors on hormonal therapy : Participants recruited from 2007-2010; Initially looking at sleep, the study found that musculoskeletal symptoms improved; move directed study needed. Restorative and gentle yoga was used. Author manuscript; available in PMC 2016 Apr 1. Breast Cancer Res Treat. 2015 Apr; 150(3): 597–604. Front Hum Neurosci. 2018; 12: 67. 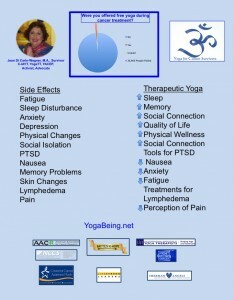 ♦Yoga can be effective in reducing symptoms of depression and anxiety. ♦Yoga has few contraindications and few side effects. Systematic Review of the Efficacy of Meditation Techniques as Treatments for Medical Illness Background: Meditative techniques are sought frequently by patients coping with medical and psychological problems. “Safe and effective..
Mindfulness at school reduces (likelihood of) depression-related symptoms in adolescents Secondary school students who follow an in-class mindfulness program report reduced indications of depression, anxiety and stress up to six months later. Moreover, these students were less likely to develop pronounced depression-like symptoms. Summary: Secondary school students who follow an in-class mindfulness program report reduced indications of depression, anxiety and stress up to six months later. This Acceptance and commitment therapy ( ACT) Mindfulness and Buddhist ideas. BMC Complement Altern Med. 2017 Aug 8;17(1):390. doi: 10.1186/s12906-017-1898-Study protocol on comparative effectiveness of mindfulness meditation and qigong on psychophysiological outcomes for patients with colorectal cancer: a randomized controlled trial. Ho RTH1,2, Wan AHY3,4, Chan JSM4, Ng SM4, Chung KF5, Chan CLW4. Large study showed significant pain management improvement in meditation and qigong, lower stress level, and overall QOL. Moderate-quality evidence supports the recommendation of yoga as a supportive intervention for improving health-related quality of life and reducing fatigue and sleep disturbances when compared with no therapy, as well as for reducing depression, anxiety and fatigue, when compared with psychosocial/educational interventions. Yoga practices positively address many of the side effects that cancer patients, survivors experience. These effects are also felt by anyone involved in cancer research: scientists, doctors, nurses, therapists, caregivers. Yoga practices encompasses the entire person: mind, body, emotions, and spiritually (not religiously). More studies are needed in the field of Yoga Therapy and Cancer. Relax and Renew, by Judith Laster, Ph.D. Bed, recliner, couch or floor is perfectly fine. Let me tell my story, since this day, thirteen years ago, I was in surgery having a foot of sigmoid colon removed. I had a twitchy gut all my life, bloating and sensitivities. It didn’t feel very different, in the beginning, when I had reflux and bloating. I was 44 and otherwise “healthy”. I worked, was raising a daughter with my husband, took care of my aging mom, was singing, doing 12 step, doing yoga, weights and aerobics. But I felt tired. Unbelievably tired. I started napping long hours. My stomach pain grew worse. I went to the doctor and told I was depressed. I took the pills, and didn’t feel any better. I took time off of work, and started to feel bad about myself and my inability to cope with life. I was so damn tired. I started having back pain, leg pain, the cancer was eating through the nerves and outside my colon. I got night sweats and felt full, even though I stopped eating. Finally, I saw blood in my stool. Then, for sure, I knew I was really sick. After six months of weekly chemo infusions of 5FU, so aptly named, with Leukovarian, I was totally depleted of any physical power. My spirit remained strong, but my body felt ready to leave the earth. I was tempted to go. But our daughter was now 16, and whatever I could do to stay, I would do. It meant learning to live in a body that was scared, painful, weak, unbalanced and almost certainly not going to live very long. I asked the God of my Understanding to make my life, whatever time I had left, to be of purpose. My career path switched to training to be a yoga teacher for cancer survivors. Not many people were training, so I used my experience, my knowledge of teaching and my 20 year practice of yoga to help myself begin. I started with breathing. I had lost my breathing stamina. It took time. It took willingness to start a class in San Diego for patients, family, and caregivers. I started attending advocacy trainings for crc and ended up making a CD to hand out to cancer patients. I continue to make digital downloads, teach yoga, train yoga teachers from around the world on my online course, and use social media to reach survivors, like me, home in bed, and not knowing what to do to feel better. For as long as I am able, my service if my passion. What’s the buzz about yoga for cancer patients? And is there solid research to back all the claims? If we look at the research over the last two decades, we will be mislead into thinking that yoga studies show no real benefit, largely because the studies that were conducted were poorly designed and executed. The Cochrane synopsis says that yoga itself was defined in too broad of category, from vinyasa flow active yoga to restorative yoga. And since there is no agreement within the studies about what yoga practice should be used; it’s hard to ferret out any truth about its benefits for a wide range of cancer patients and survivors. can then borrow the research done on breathing techniques for stress reduction. The heart of yoga is breathing. What separates yoga from other forms of exercise is its close attention to movement connected to breath pace. Gentle range-of-motion movements, using one’s breath as a guide is a form of meditation in itself. So, what we can infer with confidence from the plethora of studies on the benefits of breathing practices from reducing anxiety to helping people cope with pain. Anecdotally, most of my yoga students in treatment for cancer report that they use diaphragmatic breathing as their main coping tool when stressed, fatigued, experiencing sleeplessness or when they are in pain. The structure of a yoga class designed for cancer patients and survivors should highlight known meditation practices that are documented in other populations of people under severe stress, like war veterans. In fact, the U.S. military forces are doing most of the latest research on Integrative Medicine, in an effort to care for war veterans. Meditative practices include, yoga, Thai Chi, Qi Gong, mindfulness meditation, massage, and acupuncture. Cancer patients often suffer anxiety post treatment, just as war veterans do from engaging in life-threatening battles. Here again, inferencing the similarities in beneficial complementary approaches we can extrapolate the benefits to cancer survivors. Cancer patients are living longer, with advancements in cancer treatments. However, their quality of life is taking precedence over mere survival. Yoga can have a profound positive effect on the quality of life of survivors. Research is clear on this one point. Perhaps the most promising studies on meditative practices include regained length on their telomeres (a DNA indicator of aging). Morning blood cortisol levels showed significant drops after meditative yoga practices in as short as eight weeks. Blood pressure can be lowered with diaphragmatic breathing practices, as well as, the metronome of the heartbeat. There are many reasons to give yoga a place in the treatment of cancer survivors. Thank you to the Ruesch Center for inviting me to share my passion for yoga, And to Chris4life.org for supporting my reach to cancer patients through their community called “COLONTOWN”. Jean’s Yoga Tip #171: Our tongues are amazing! Stick yours out. Go on, all the way out and point it down. Now, say your name. I keep your tongue out and say your name. This helps activate our abdominal muscles, tone our chin and giggle. In yogic philosophy, the tongue is the connection to all the glands in the body. Now breathe in and out, sticking your tongue all the way out, and then bring it all the way in. Happy Yoga Tongue! Nine years ago, this October 28th, I finished treatment for iiic colon cancer. I was 47, and had been a Resource Specialist for over 25 years, mostly in San Diego. But my chances of recurrence were high, so I retired early, thinking that I had about five years to live (if I was lucky). Chemotherapy was devastating to me and not having a job was depressing and scary. I worked at home to rebuild my strength and my life’s purpose. Always a yoga enthusiast, I found I couldn’t do what I was used to doing. Others must be having the same issue – trying to find a way back to a ‘new normal’? I became a yoga teacher and yoga activist. 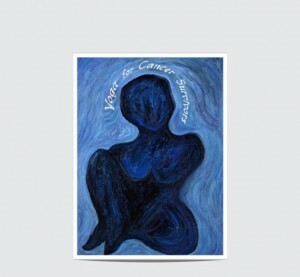 I am a listserv consultant on many cancer sites and made a yoga cd, gave away over 3,000. The YCS cd is now available for free download, and in Spanish, too. Russian is the next language and I hope to have it translated into as many languages as possible. 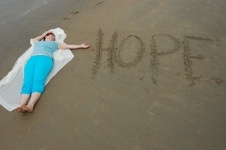 I speak at cancer symposiums and teach YCS yoga in San Diego. I am putting a 45 hour teacher training on line by January 2013. We hear so much about yoga to rebuild and regain strength, but for me, it was about dealing with the emotional, physical and psychological effects of cancer where yoga has done its greatest healing. I specialize in teaching patients in therapy and long-term treatment. You can download hours of meditations for survivors and the 80 minute yoga class in English and Spanish for cancer survivors by going to my audio page on this website.